TODAY'S YOUR DAY TO START SOMETHING NEW. From this old city in the New Midwest we greet the sun, ready to build. To invent. To improve. To flip the switch on something better. 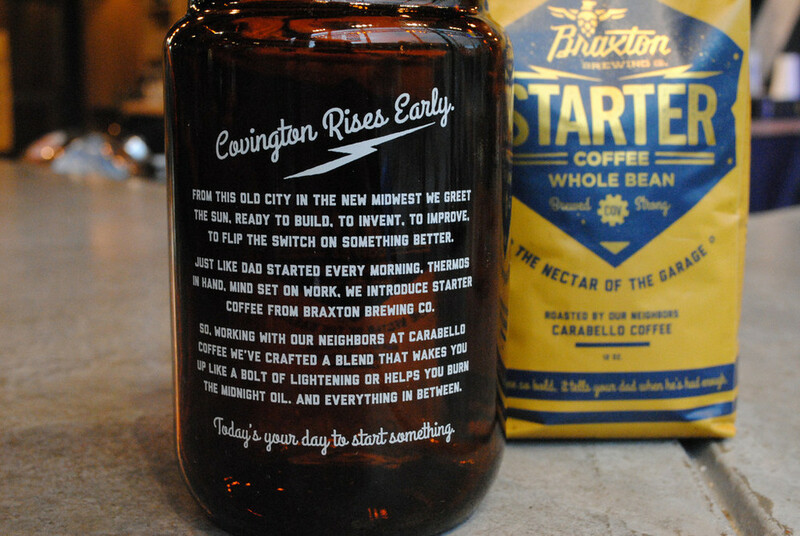 Just like Dad started every morning, thermos in hand, mind set on work, we introduce Starter Coffee from Braxton Brewing Co. Coffee has been a part of us forever. Our dad always had a pot on in the garage, and occasionally he would let us have a cup, with lots of cream and sugar, of course. Dad took his "the blacker, the better," and about the same weight as brake fluid. He also kept the old cans, never threw them away. He used them for cleaning old parts, storing odd bolts and screws, mixing paints and stains. You know, the typical stuff, Dad became a recycler long before it became cool. So we've crafted a blend that wakes you up like a bolt of lightning or helps you burn the midnight oil, and everything in between. Welcome to the Taproom of the Future! We open at 8am to welcome the startup community to use the fastest internet (gigabit WiFi) in the world, our projector screen, and white boards painted on the walls. But don’t worry, the space is all about fun as well! With a 1,000 square-foot garage in the middle of the taproom, we’ve built the perfect meeting or event space for groups from 10-60! So stop in for a pint, tour our facility, and Lift One to Life with us in our garage! Our Taproom, located at 27 W 7th Street in Covington, Kentucky was designed and built to remind us every day where we came from - the Midwestern Garage. You see, we view the garage as the icon of American Innovation, and to honor that notion we’ve built a space that’s open to the community. What we're doing here is unique. We know that and so do our fans. Sharing our space, our coffee and our story with the community we work, live and play in is something we take tremendous pride in. Learn more about this project and product by reading the features below. Let's lift one to life! Starter Coffee (aka nectar of the garage) is a collaboration between Carabello Coffee, of Newport, Kentucky, and Braxton Brewery, of Covington, Kentucky with a focus on kick-starting entrepreneurs and crafting unique barrel-aged coffees. NEW HOURS. NEW SPACE. THE SPARK TO START. Braxton is excited to invite the startup and remote working community into the taproom to leverage our unique resources to help build the future. The Taproom of the Future is coming to Covington, Kentucky. And yes, it includes coffee. It's a small-business incubation hub for the growing class of young-entrepreneurs in Greater Cincinnati.